Dr Stan Scott, Queen's University Belfast. The Times Higher Education Supplement. 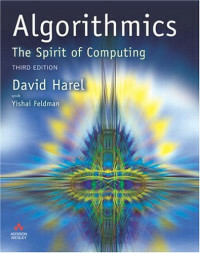 This book tells the story of the concepts, ideas, methods and results fundamental to computer science, in a form independent of the details of specific computers, languages and formalisms. It concerns the true 'spirit' of computers; with the 'recipes' that make them tick - their algorithms. Chapters on software engineering and on reactive systems. Thoroughly revised chapter on programming languages. New material on quantum and molecular computing. Whole text thoroughly updated to include new material on many topics, including abstract data types, the object-oriented paradigm, primality testing, and system verification and validation. David Harel is Professor and Dean of the Faculty of Mathematics and Computer Science at the Weizmann Institute of Science. He is renowned for outstanding research in many areas of the field, and has recently been awarded the Israel Prize in Computer Science. Yishai Feldman is on the faculty of the Efi Arazi School of Computer Science at the Interdisciplinary Centre, Herzliya. He specializes in the use of atificial-intelligence techniques in software engineering and its real-world applications. PowerPoint dominates the presentation landscape. With the changes in PowerPoint 2010, including the availability of an online version, PowerPoint users need this comprehensive reference to make the most of the program.